Mango Mastani is a very thick mango flavoured milkshake topped with a scoop of ice-cream, nuts, and chopped fresh fruit. Often tutti fruity or glace cherries are also used as toppings. You can get as creative as you like with the toppings. Mastani comes in many flavours – mixed fruits, pineapple, chikoo, etc. 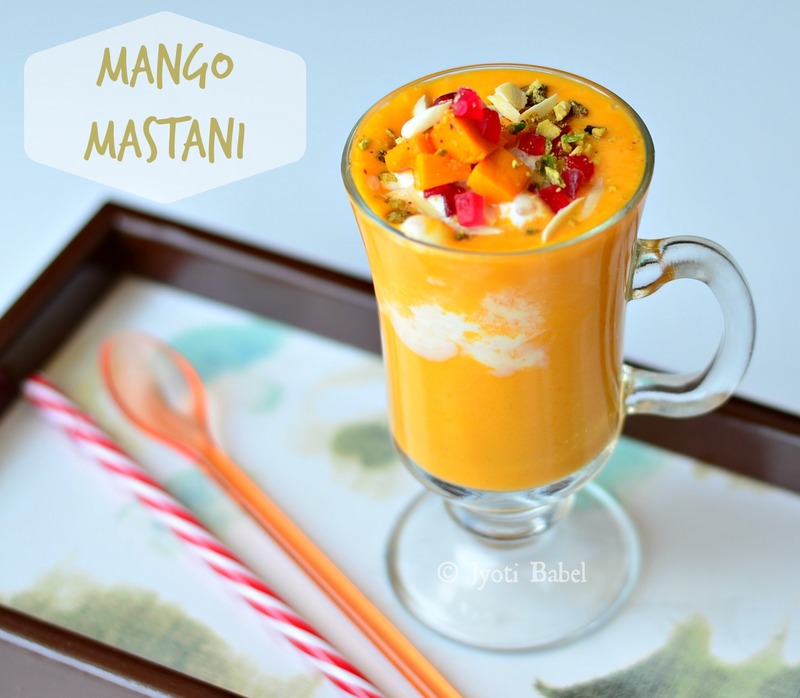 But, since mangoes are in season now I am going to share my how I make Mango Mastani at home. I am a very big fan of mangoes. Despite that, I have hardly shared any mango based recipes in this space. Well, there is a reason. Mangoes are something I really look forward to during the summer months in India. Every year, I think of ‘n’ number of mango recipes to try, but every year I end up enjoying the mango fruit as it is. Mangoes are so delicious in itself that I don’t really have the patience to make something out of it. I grew up in Assam gorging on the best Langda Mangoes. But, this variety of mangoes is not common in Pune. Here it is all about Alphonso or Haphus Mangoes – they are quite flavourful, luscious and sweet. But, still, my heart longs for the Langda Aam. We do them get here for a short while, and I do not miss the opportunity to get a bagful home – I guess they are transported here all the way from Bengal. 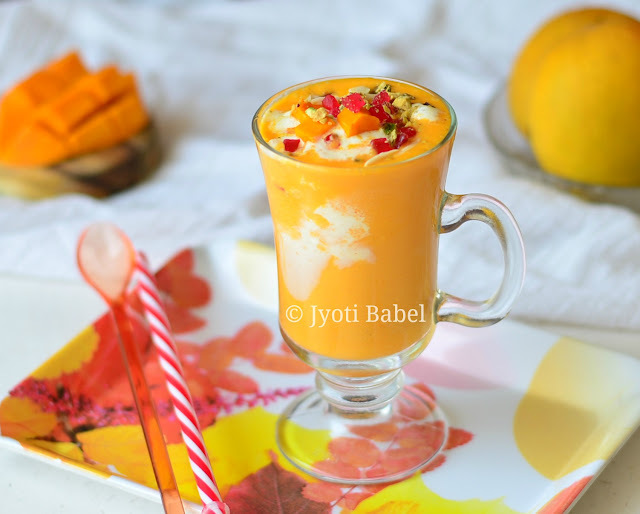 The mango mastani recipe I am sharing here is a Pune special drink. Soon after we had shifted to Pune some years back, I came across this drink named Mango Mastani and I thought – what a name! While there are no established facts about it but, it is said to be named after Peshwa Bajirao’s wife Mastani. I guess most of us who are into Bollywood movies know about her from the movie ‘Bajirao Mastani’. Let's check out the recipe for mango mastani now. 1. 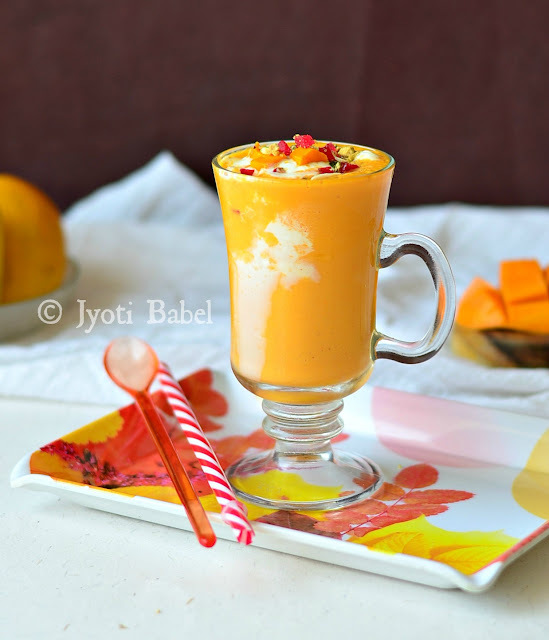 In a blender jar, add the mango pieces, sugar and milk and blend it until smooth. Adjust sweetness to taste if needed. 2. In a tall glass, add the prepared thick mango shake. Top it with a scoop of vanilla ice-cream, chopped nuts, fresh mango pieces and tutti fruity. Serve it immediately. Enjoy! 1. You can also add 1 or 2 tbsp condensed milk to the shake. You may have to adjust the sugar quantity as needed. Mango Mastani is a good idea. Will try.